clean&simple: Fall To Layout #54! This layout was inspired by Nancy, who was inspired by Susan. Isn't it fun how one cool idea gets around? This sketch can be easily done as a 1 or 1.5 layer card. By that I mean, it's mostly one layer, but there can be a cut out, 3-d element attached. 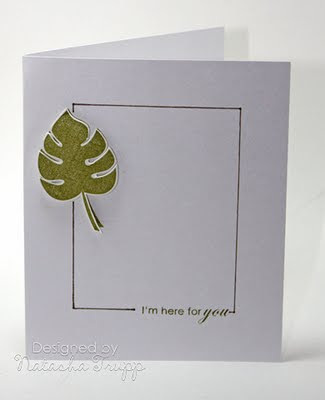 My card originally was just the one layer, but I didn't like how the leaf had stamped. Instead of starting over, I stamped a second leaf, cut it out, and popped it over the first. Love, love, love this...and Nancy's...and Susan's! Thanks for sharing this great layout! I just LOVE this sketch! So glad I found it and Susan shared it for me to find!! LOL! 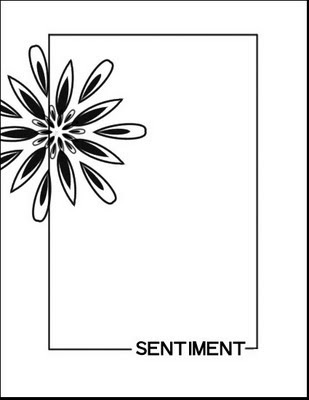 This is a very versatile layout,,,for any occasion,,and love your take on it. your work is very inspiring. Love that popped up leaf! And thanks for the call-out...I'm so flattered! Hi Natasha!! Love this layout, I made a card to share!!! I have been admiring your work for sometime and really wanted to make a card with your pretty layouts!!! Please click on my name above, it will take you to my card!!! Fabulous sketch! Loved this challenge! I just love this sketch! Quite frankly, I love all the sketches on this blog. I use them quite a bit but I always forget to post a link here. Thanks for the inpsiration! I love this layout. Here's my attempt. Love this LO! You can see my card here.